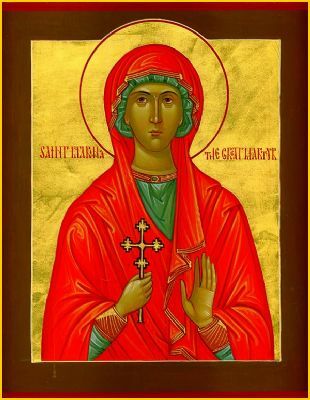 ST. MARGARET was the daughter of a pagan priest at Antioch. She lost her mother in infancy and was placed in the care of a nurse in the country, who was a Christian, and whose first care was to have her little charge Baptized and to give the child a Christian education. Margaret grew up a modest, pious virgin, and when she returned to her father he was charmed with the grace and virtue of his daughter. He regretted only one thing; she took no part in the worship of the idols. When she told him the reason he was greatly displeased, for she stated that she was a Christian, and that nothing should separate her from the love of Christ. Her father tried every means to change her mind, and when all his endeavors failed became enraged and drove her forth from his house. Margaret returned to her nurse and became her servant, doing all kinds of menial work, and at the same time perfecting herself in virtue. About this time Emperor Diocletian began to persecute the Christians. One day Alybrius, the prefect of the city, saw Margaret, and fell in love with her. He sent a messenger to ask her in marriage. The pious Virgin was filled with consternation at the proposal and replied to the messenger: “I can not be espoused to your master, because I am the spouse of Our Lord Jesus Christ. I am promised to Him, and to Him I wish to belong.” When the prefect heard this, he became furious with rage, and gave orders to have the Virgin brought to him by force. At this reproof the prefect became angry and ordered the tender Virgin to be cruelly scourged, placed on the rack, and torn with iron combs. Then she was cast into prison. There Margaret fervently thanked God for the victory she had achieved and implored His help for the combat yet in store for her. Suddenly there appeared to her the arch-enemy of mankind in the shape of a furious dragon, threatening to swallow her. The brave Virgin feared him not, but made the Sign of the Cross, and the monster vanished. Then her desolate prison cell became suffused with Heavenly light, and her heart was filled with Divine consolation. At the same time her terrible wounds were suddenly healed, and not the least scar was left. Next day Margaret was again brought before the prefect. Surprised at her complete recovery from the effects of his cruelty, he remarked that no doubt it was due to the power of the pagan gods, and exhorted her to show her gratitude to them by sacrificing to the idols. Margaret maintained that she had been healed by the power of Christ alone and declared that she despised the heathen gods. At this, the rage of Alybrius knew no bounds. He ordered lighted torches to be applied to Margaret’s body, and then had her cast into icy water to intensify her torture. But scarcely had this been done when a violent earthquake occurred. Her bonds were severed and she rose unscathed from the water, without a mark of the burns caused by the flaming torches. On witnessing this miracle, a great number of spectators were converted to the Faith. Finally the prefect ordered Margaret to be beheaded. Her glorious Martyrdom and death occurred about the year 275. Almighty and everlasting God, who dost choose the weak things of the world to confound those things that are strong: mercifully grant that we who keep the feast of blessed Margaret thy Virgin and Martyr, may feel the succour of her intercession in thy sight. Through our Lord Jesus Christ, Thy Son, Who liveth and reigneth with Thee in the unity of the Holy Ghost, God, Forever and ever. Defend us, we beseech Thee, O Lord, from all dangers of mind and body: and through the intercession of the blessed and glorious Mary, ever Virgin, mother of God, of St Joseph, of Thy holy apostles, Peter and Paul, and of all the saints, in Thy loving-kindness grant us safety and peace; that, all adversities and errors being overcome, Thy Church may serve Thee in security and freedom. Through our Lord. Graciously hear, O Lord, the prayers of Thy Church that, having overcome all adversity and every error, she may serve Thee in security and freedom. Through our Lord Jesus Christ, Thy Son, Who liveth and reigneth with Thee in the unity of the Holy Ghost, God, Forever and ever. Receive, O Lord, the offerings we bring on the solemn festival of Thy blessed virgin and martyr, Maragret; by whose intercession we hope for deliverance. Through our Lord Jesus Christ Thy Son our Lord, Who liveth and reigneth with Thee in the unity of the Holy Ghost, one God Forever and ever. Graciously hear us, O God our Saviour, and, by virtue of this Sacrament, defend us from all enemies of soul and body, bestowing upon us Thy grace here and Thy glory hereafter. Through our Lord. Protect us, O Lord, who assist at Thy mysteries, that, cleaving to things divine, we may serve Thee both in body and in mind. Through our Lord Jesus Christ, Thy Son, Who liveth and reigneth with Thee in the unity of the Holy Ghost, one God Forever and ever. Filled with the Gifts of Thy divine bounty, we beseech Thee, O Lord, our God; that by the intercession of blessed Margaret, Thy Virgin and Martyr, we may partake thereof for evermore. Through the Lord Jesus Christ, Thy Son, Who liveth and reigneth with Thee in the unity of the Holy Ghost, one God For ever and ever. May the gift of this Divine Sacrament which we have offered, cleanse us and defend us, we beseech Thee, O Lord; and through the intercession of the Blessed Virgin Mary, mother of God, of St. Joseph, of Thy holy apostles Peter and Paul, and of all the saints, free us from all iniquity and deliver us from all adversity. Through the same Lord. O Lord our God, we pray Thee that Thou suffer not to succumb to human hazards those whom Thou hast been pleased to make sharers of divine mysteries. Through the same Lord Jesus Christ, Thy Son, Who liveth and reigneth with Thee in the unity of the Holy Ghost, one God, For ever and ever.